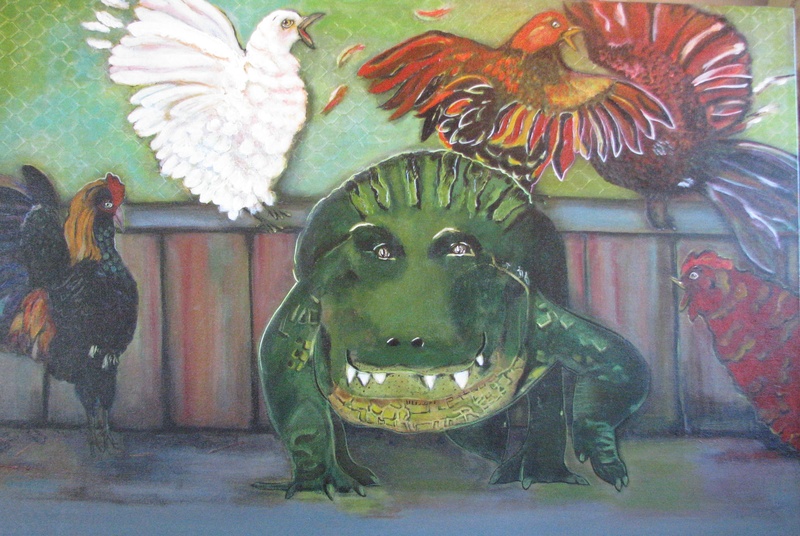 My steps to putting art on-line and check out my finished gator. Gorgeous today in New Orleans. I opted out of a picnic so that I could write to you. I need to keep a work schedule or I feel like a fraud. Today, I am starting to list 4 of my originals. Dorka sent me the files of the photos she took of my most recent paintings. I changed the size of the photographs slightly. Dorka discourages me from changing the photos too much by myself. Then I up-loaded two sizes to Fotoworks Pro. The sizes I offer are 8.5 x 11 and 11 x 14. I tried printing 8 x 10, but that seems too small for art. Fotoworks Pro is in Southern California and I work with them through the mail. I have had only positive experiences with their personal service and great quality. After I ordered prints, I started up-loading to Etsy and WhereY’Art. The difference, I think, between the two Internet stores is Etsy is international and Where Y’Art is local. I have been with Etsy for a few years and am pretty happy with it. I just started in February with Where Y’Art. I love that it is local and I know the owners and some of the other artists. Where Y’Art also offers shows out in the community a few times a year. I will let you know more later… when I know more. I used to hate the business part of painting. Now I like it. It is like having a secretarial job for a day. I wanted to be a secretary once. I hope your day is going great. We are having a blustery Tuesday. It is really cold and windy out there. I know I shouldn’t complain because we don’t have snow, but we are supposed to be a tropical climate. I was given a big sheet of copper. I took it to a metal shop and had it cut in 8 x 10 inch pieces. I think I have about 50 pieces. I can cut them smaller myself, but the copper is pretty thick. My idea is to put some of my art on the copper. I tried using a transfer paper called TAP. It is designed for transferring onto material, but it advertises that it transfers to any surface. I chose Baby, I got this. 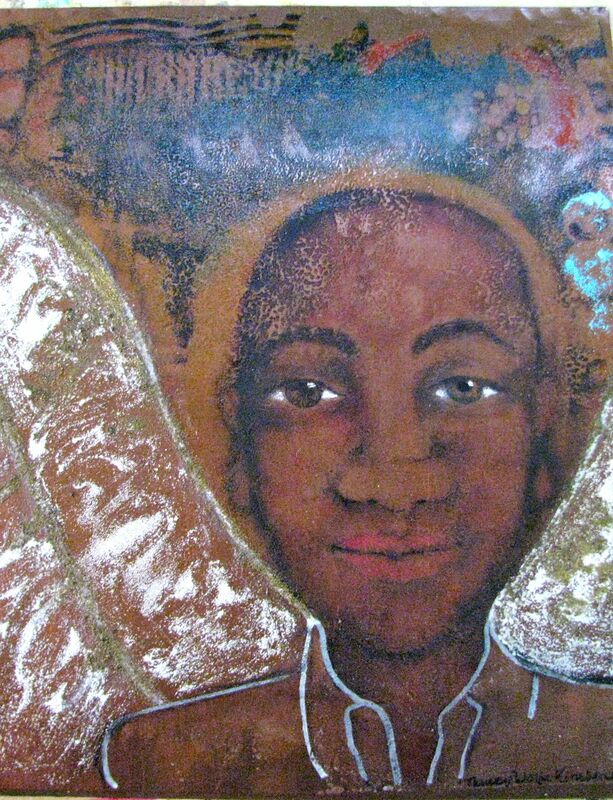 because his skin color is so beautiful, but the white wings did not transfer. I added some color to his lips with red paint and darkened his features with black paint. I painted embossing powder on the wings with varnish, then used a heat gun until it bubbled. I sealed his face with wax and the rest of the copper with varnish. I won’t use the wax again. It didn’t make that much of a difference. I tried printing the same photo on organza. This was easy. I just attached the organza with varnish. My plan is to nail the copper onto reclaimed wood with copper tacks and add some kind of embellishment. If you have any ideas for this project, let me know, please. 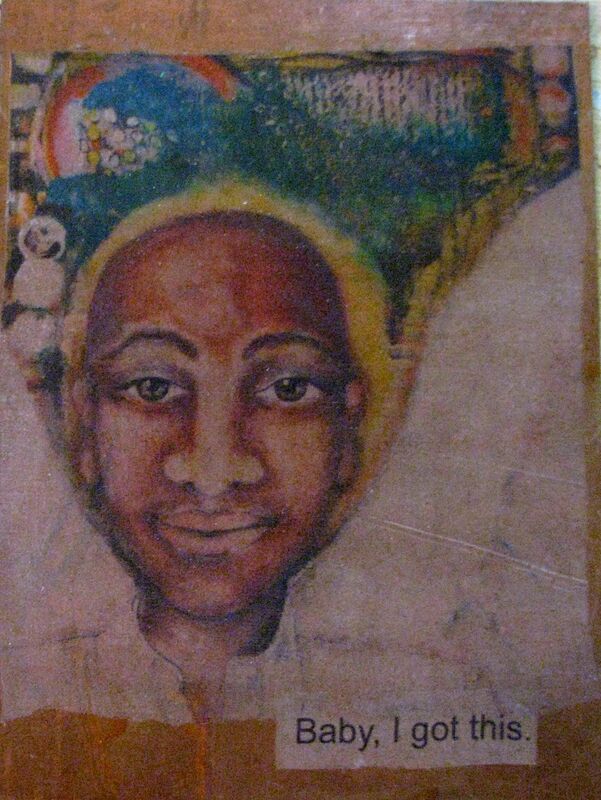 I plan on taking a few finished pieces to Bayou Boogaloo to see if people like them. I also bought a silk screen kit to try with the copper. So far that has been a big mess, but I am not through. I have painted Nice Hair a little bit. I have an idea that might help you if you are just starting to paint faces. 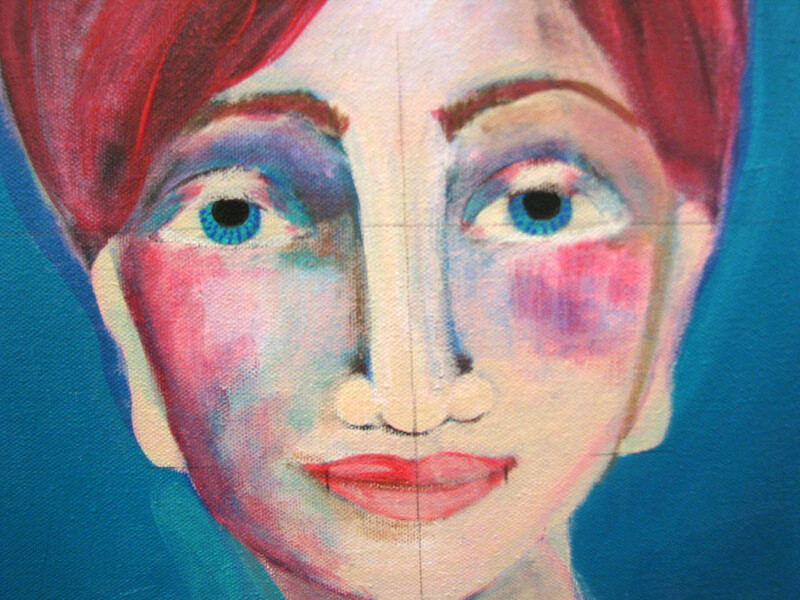 I started by painting her face and hair, then I stopped and measured. Are her eyes level? Her ears the same size? It saves me from painting her over and over without knowing why she looks out of whack. I painted her before I measured because I don’t want to be too controlled. Nice Hair with pencil marks. When I put the pencil marks on, her left ear was short and one of her pupils was more dilated. A little quirky is good in a face, but some things like pupils just look off. I don’t know where I am going with this yet. Right now, I am getting ready for my in-laws. They are coming tomorrow for Easter. I always feel like I need a block of time to get started on something. I might be able to pop in here once in a while. We’ll see. I really would appreciate any copper feedback. I wanted to finish Gator in the Hen House before I wrote to you this week. I am taking 4 paintings to Dorka to photograph this morning. This is my photograph of the finished painting. I am going to frame it with some wood I have saved under the house. This is pretty large, 24 x 36 inches. My favorite part is the alligator. My second favorite part is the chicken wire. My goal was to make the gator the center of attention with a smug and cavalier attitude. 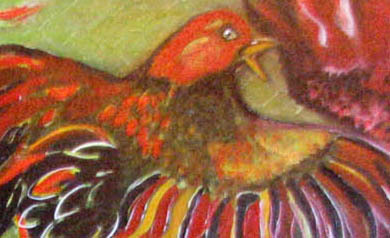 The chickens are a riot of color and feathers. They each have their own personality. I raised the chicken wire with molding paste, then lightly brushed some Golden Green Gold and Cobalt Teal back in. 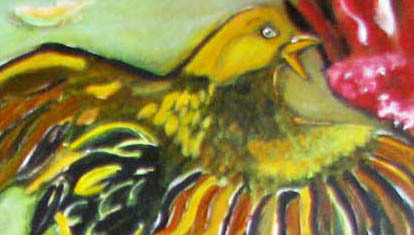 The rooster was painted with Golden’s Permanent Violet Dark, then Carbon Black and more colors. The shiny parts are Silk’s Acrylic Glaze. This rooster is standing as straight as he can on his tiptoes trying to look invisible. This hen’s eyes are starting to roll back in her head. She thinks she might faint. 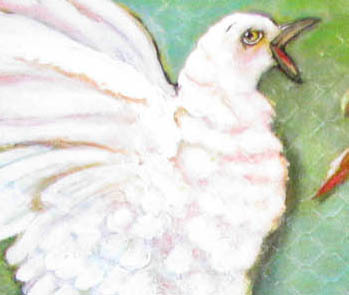 I used Golden’s molding paste and Liquitex heavy body acrylic on the white chicken. I said “used” because I painted with a brush, my fingers and a palette knife. I loved this chicken when she was pure green, but I wanted her to be a more realistic color and contrast with the gator. 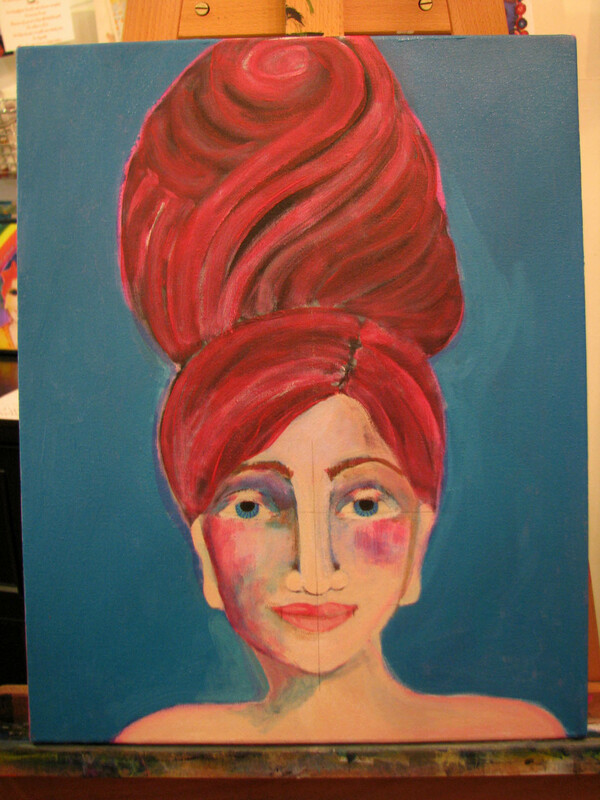 So I changed her to..
On Mama Chicken I painted with acrylic paint and Dylusions Postbox Red Ink Spray. I painted with it, not sprayed it. I love how it saturates. I had to seal the hen with varnish and then paint the white bits back in. When you paint with ink it keeps soaking through. I made the floor of the hen-house dirty, by putting broken toothpicks and beads in black and tan paint, putting them on the floor of the hen-house and pulling the pieces off with tweezers. I knew I would have a hard time making the dirt look random, otherwise. 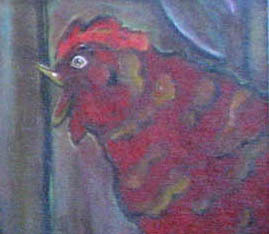 One of the challenges of this painting was to keep the chickens in the background as supporting actors. They really wanted to take over. 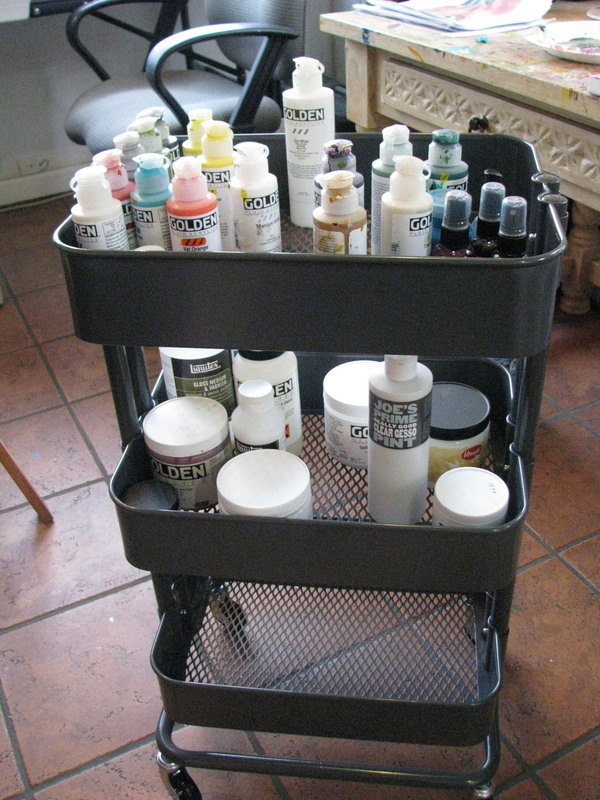 I bought this cart at IKEA. I love it more every day. Each day I have to trust again that I am on the right path. For me, right now, it seems like the only one. So I am putting one foot in front of the other and going on. 74 degrees and everything is starting to bloom. Don’t hate. It will be unbearably hot before you know it. With Spring comes house guests. It is fun to see our city through the eyes of someone here for the first time. When someone has been here before, I like to act as a bed and breakfast. But for the first time visitor there is so much to see, I think a tour is in order. We have friends here from California this week. After 6 days of being a tour guide, I felt they had seen enough of New Orleans for a first visit. I was not willing to release them before this. (It is such a great city, I think you really have to live here full-time to experience it.) Today, Mary and Ulco are taking a self-guided walking tour of the Garden District. We went to Hogs for a Cause at City Park on Saturday. It had rained all night and it was a muddy mess. *House guests don’t really like wading around in the mud. To be honest, we didn’t like it either. We stopped by Chickie Wah Wah to see Paul Sanchez. 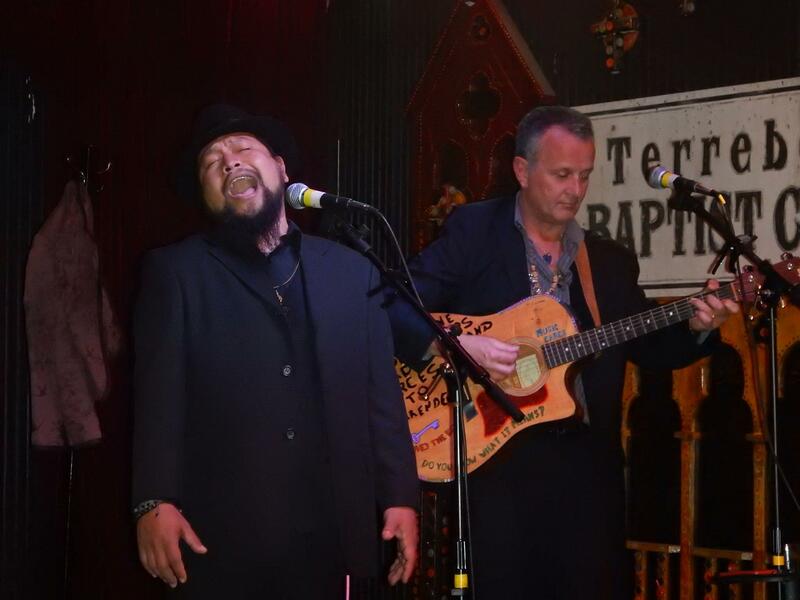 He invited several guest artists on stage during the show. It was super fun. I have to go see Antoine Diel again. 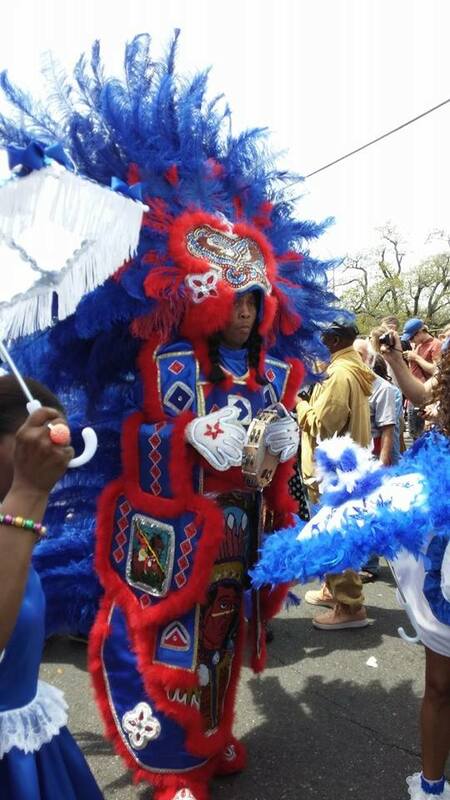 We were super lucky to see the Mardi Gras Indians on Sunday. After that, my sweet darlin’ drove them through the 9th Ward and Chalmette. The top 3 things we did this week were: 1) the French Quarter. 2) the New Orleans School of Cooking. This is a great over-view of history as it relates to food. 3) Honey Island Swamp Tour. I like this tour for a first visit because it is close to the city and well run. The restaurants are too many to mention. Art? No art. I better get busy.